Ceri Williams, a Business Improvement Consultant for BT, recently attended one of our SMARTworking workshops. He explained how he uses his dyslexia as a strength to tap into his creative side. 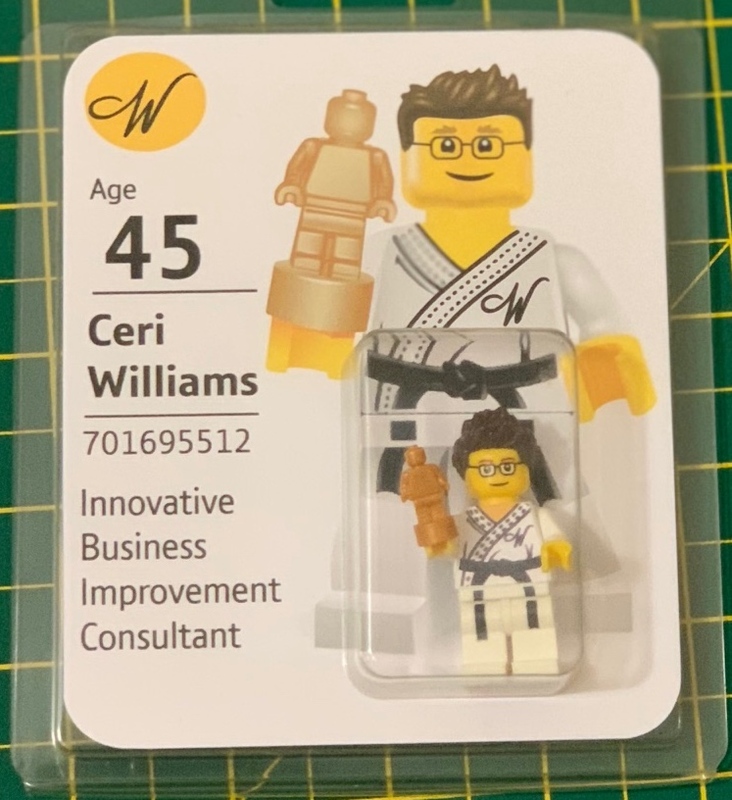 Ceri’s an accredited LEGO SERIOUS PLAY facilitator and frequently uses LEGO to visualise / solve problems and embed simple guiding principles. 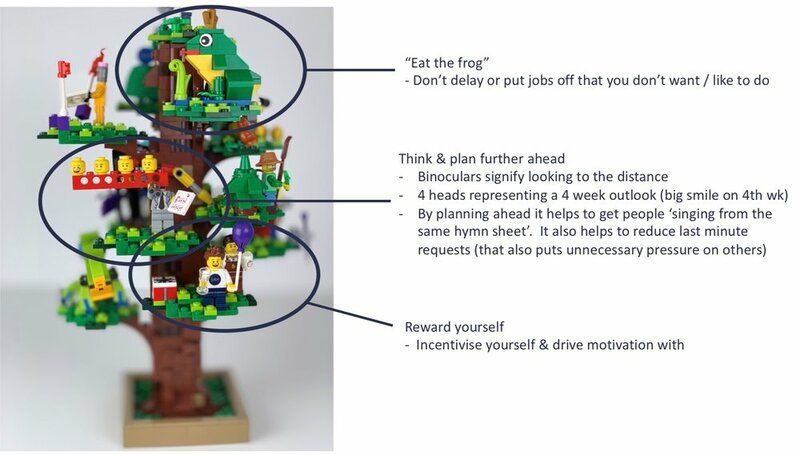 After the workshop he built a Lego model in the form of a tree, with each branch representing a different key message from the training programme. We thought this was imaginative and also an inspiring way to represent the tips, techniques & tools we share PLUS a striking new way for you to reflect on the key principles of personal productivity. Please tell us what you think. When the “beast from the East” brought us snow it led to many things being cancelled – trains, planes, meetings, social events etc. When something is unexpectedly cancelled we can feel disappointed but sometimes we experience the “free day” feeling. Not to be confused with that “Friday feeling” but they both feel good (smiley face). That “free day” feeling is that feeling you get when someone says the training event or meeting tomorrow is cancelled and you get a “bonus” or “extra” day to catch up on your work. You sigh a sigh of relief and relish the thought of getting back on top of things. You know what I mean. So I thought., “Why not design these into your work life?” Because I have noticed that even the most productive, efficient and disciplined people don’t get everything done every week. None of us are perfect. My estimate is that each week people have a couple of hours of catching up to do to “truly stay on top” and feel great about their productivity. Over a month this will mount up to 1 days worth of work and you know how quickly work can mount up don’t you? So that’s why, a few years ago, I ran my “catch-up” experiment. Knowing each month I was at risk of being behind by 1 day I scheduled in a “catch up day” on the third Wednesday of every month. Why then? because for me that was a good time. But for you there might be a better time. The rule I set for that day was that I booked nothing into it and protected it from others booking time in it. The “catch up” day provides the macro buffer of time I need to continually feel on top of things PLUS I get that “free day” feeling at least 12 times a year. Because of the “beast from the East” I got a bonus “free day” today which has been my inspiration for this TIP. Who likes to feel out of control at work? Who likes to feel continually behind with their work? Who likes to feel overwhelmed? Not many of us I would guess, but many of us have felt this way at some point and probably in the fairly recent past. This article can help you reverse, reduce and permanently remove these potentially damaging situations from your work life. On the last working day before people go on holiday most people create a list. 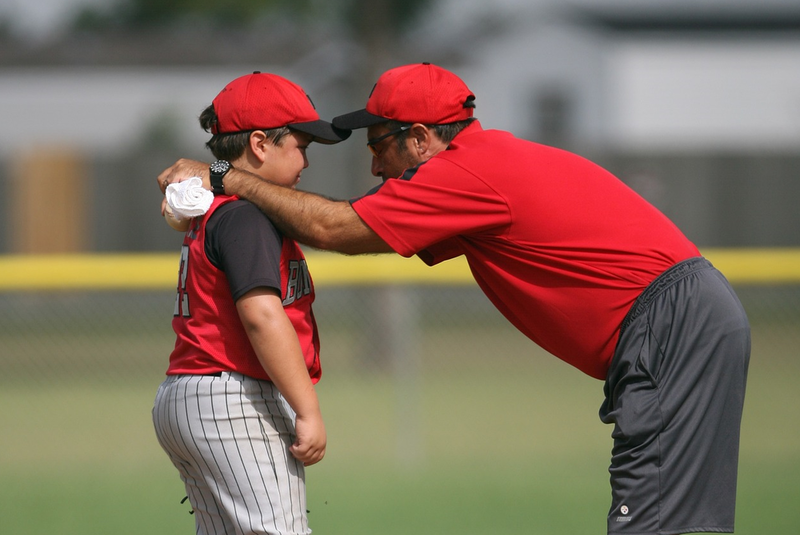 They do this to ensure they forget nothing, prioritize, plan, stay focused and motivated. People like lists because they are quick and simple to create. But they don’t seem to like them enough to do them every day, do they? This is strange because there are few work days where you would want to forget to do things, where you wouldn’t want to prioritize and plan your tasks, where you wouldn’t want a plan to keep you focused and motivated. So why don’t people always create a list? If people don’t prioritise (point 1) they can be indecisive or easily knocked off course during the day. Worst still other people indirectly end up prioritising for them or they spend their entire day asking “What shall I do next?” (dangerous because people often make this decision emotionally, or allow other people again to decide for them). Point2 - By not estimating how long each item will take you do not have a way of checking how realistic your plan is and do not improve your forecasting skills. This means expectations and expectation setting are often inaccurate which creates undesirable stress and pressure. Finally if you do not consider points 3,4,5 and 6 not only does your list become “ridiculously” over ambitious, because you’ve ignored in the region of 3 hours of activities, but it will not give you the flexibility to respond to the inevitable requests at short notice. Remember that if you don’t plan your time there is always plenty of other people willing to step in everyday to do that job for you! Scientists very early in their career will be introduced to the idea of Ockham’s Razor. William of Ockham was a medieval monk and natural scientist who suggested that all other things being equal, the best theory or idea is the simplest and most straightforward of all the alternatives. Like all good ideas, it’s easy to see echoes of this in a wide number of disciplines. I’m thinking of Lean Manufacturing as pioneered by Toyota, or Jack Welch’s famous drive at GE to encourage speed, simplicity and self-confidence. Simplicity is something we also respond to on an emotional level – that’s why minimalist interior design, or Zen gardens have caught the popular imagination in these hectic times. Common sense tells us that in many situations, less really is more. This has got me thinking though. How often do you see the training and development sector take a similar position? "I can teach you most of what you need to know in a couple of hours"
"What can we take out of our program, to make things easier to understand and implement?" 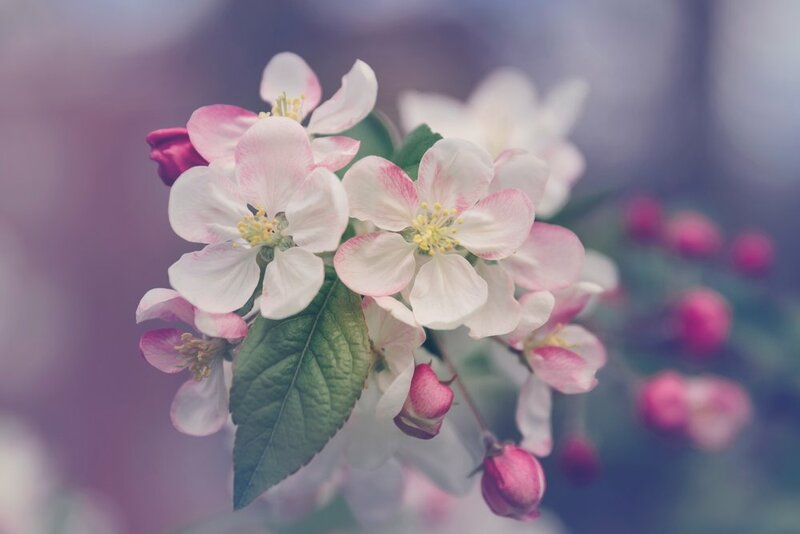 The fact is, in learning and development the values of simplicity are rarely applied to the way people are taught to lead and manage employees. And I think there is a very simply reason why this “leap” in thinking has not yet taken place. In learning and development, conventional thinking is still, just that: conventional. It tells us that to improve leadership and management you must put more stuff in. It’s all about giving more content, more theories, more concepts, more data, moreskills, and more new ideas. Why? Because that’s what justifies the expensive price tag of the trainer, the big thud of the learners’ folders, or the plush hotel everyone convenes at to consume this learning. For people who have followed or even promoted conventional thinking, I admit this is truly frightening territory. Why? Because for too long, most leadership and management development courses have all been about “putting stuff in” rather than taking stuff out, and having a model based on daily rates (days which they have to fill to give customers the perception that they are getting value for money). At Smarter Not Harder we’ve spent years analysing exactly what works, and what is essential, so that learners get the most from their time and the most meaningful learning from it. 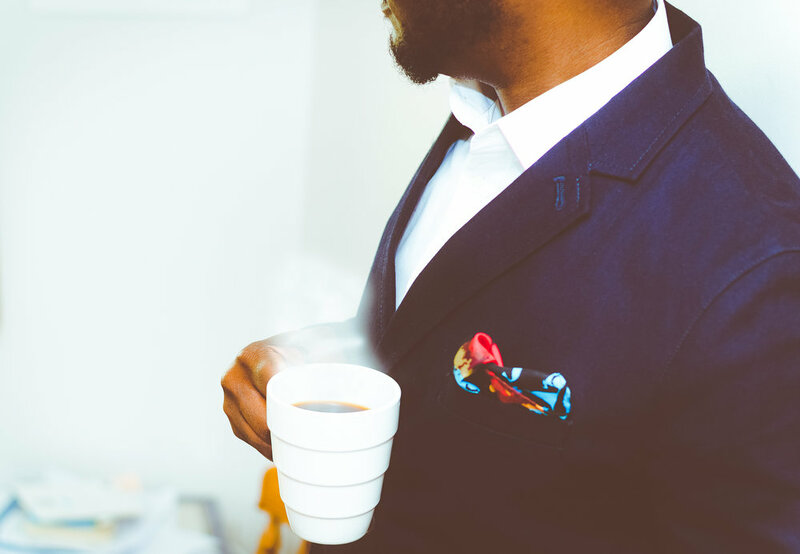 The question we are always pre-occupied with is, “what’s the least amount of time people need to spend each month to effectively lead/manage one employee?” We answer that by supplying just the learning that managers need to achieve this. It means our clients are able to lead and manage effectively in only a third of the time it normally takes & can learn to do this in hours rather than days. How many other suppliers – who all bill on a daily basis – will promote themselves this way? We do it, because we feel we’re doing what the rest of the industry urgently needs to do. And remember, with us, ‘simple’ doesn’t mean ‘easy’ or ‘less’ or ‘lazy’ or anything that is less than satisfactory. When you give people back time, and when you enable them to operate using just the best bits of management theory, they understand that all the extraneous stuff they were consuming before just wasn’t giving them any value. Often, less really is more and we believe we can show you just how transformative it can really be. The reason most people fail with their to-do lists is because what they actually create is an ‘everything list’. Like sunrise follows sunset, there are some things in life that are practically certain. Take, for example, that frequently shared life-lesson that someone, somewhere along the line will have definitely said to you: that if you want to get better at time management and productivity, you’ve got to do a ‘To-Do’ list. Now, don’t get me wrong. Far be it from me to spoil the party (I’m just as certain some of you might know about a famous psychology study that found people are 42% more likely to achieve their goals if they write them down), but hear me out. The point of a to-do list is to divide your day in such a way that you are in control of it. That is its purpose. I don’t actually have a problem with to-do lists – it’s just the way people do them. For it’s my belief that not only do 99.9% of people fail to do them properly, in doing so they actually discourage themselves from ever utilising their time more effectively – which is the very reason they wanted to do them in the first place. So why is this? Well, what happened last time you wrote your own to-do list? Did it turn into an impossibly long, never to be completed document where tasks got pushed to the next day, and then the next day, like a continually leaping frog? How did this list make you feel? Defeated? Arguably. Reminded of just how much you have still to get done? Probably. The fact is, people don’t like seeing their own disorganisation, and most of the time to-do lists are evidence of just this - labels of failure. They might have initially felt satisfying to create, but now they resemble receipts of under-performance. However, it needn’t be like this. The reason most people fail with their to-do lists is because what they actually create is an ‘everything list’. 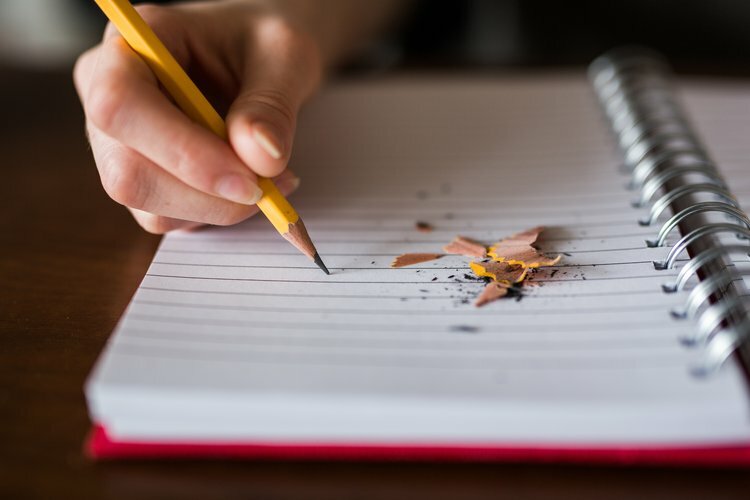 Make your To-do list a ‘To-day list’ – things you should aim to get done that day [we believe this so much we’ve actually just trademarked the phrase]. Linked to this though is perhaps the single-biggest reason to-do lists lose favour – tasks are almost never assigned with a predicted time-to-take. It sounds simple, but it rarely happens. A To-Day list should really be incorporated into a daily schedule. That's where they make most sense to be, because tasks take time. But there are other things people forget too. What about interruptions that give rise to new and unexpected tasks? While they may not be things we actually ‘want’ to achieve on that specific day [scientists say we are interrupted by something on average every three to eight minutes], we all suffer them. What I hope is becoming clear is that we need to challenge ‘to-do’ lists. It’s only via a new way of thinking, that people can prioritise and make realistic judgements about what they can achieve with the available time in their day. None of this is rocket-science. It’s simple stuff. But sometimes simple isn’t obvious. Time management is a skill that needs to be practiced, but take these few simple tips onboard, and you really will change the way you work. My advice is this: Turn to-do lists into to-day lists, to make the ‘do’ really become ‘done’. Nobody goes to work thinking, “how many people can I distract today” - do they? But all of us do distract others, both consciously or not. And all of us suffer from being distracted.g distracted. 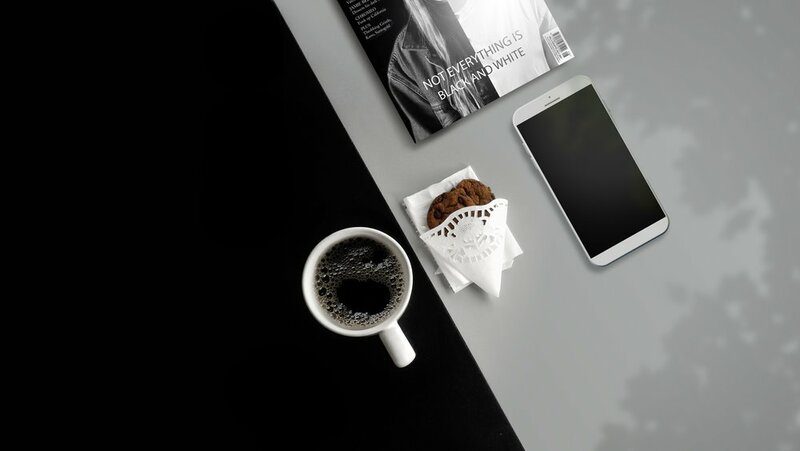 We can define a distraction as something which breaks our concentration – a person dropping by our desk, the phone ringing, an email arriving, a text or message alert popping up. The latest research says that we are distracted at work every three to eight minutes. That’s between 60-160 distractions for an 8 hour working day (“If only!”… I hear you say… to the 8 hour day that is!). So I’ve written this article to be read in two minutes and fifty seconds in the hope that you can fit it in before you are distracted again. We all know how much of a problem this has become, don’t we? Not only has the new, interconnected and wired world become more distracting. But, it’s designed to keep you distracted – click on the alert, and you’ll be drawn into reading the article. Answer the insistent ringing of the phone, and you’ll be hooked into a conversation. Yet one thing hasn’t changed. Every day must come to an end, never to be repeated – time is and will always be the most precious of resources. So how do we minimise distractions and make the most of the time we have each day? roductive use of time is a team sport. Your team needs to be conscious of not distracting others unnecessarily; you need to be aware of when you are distracting the team – and you need to take charge of your environment to elimate unnecessary distractions. Of course, if productivity is a team sport and you’re on Team Focus playing Team Distraction it’s difficult to keep a clean sheet. But it is remarkably easy before the end of the day to change the score in your favour. 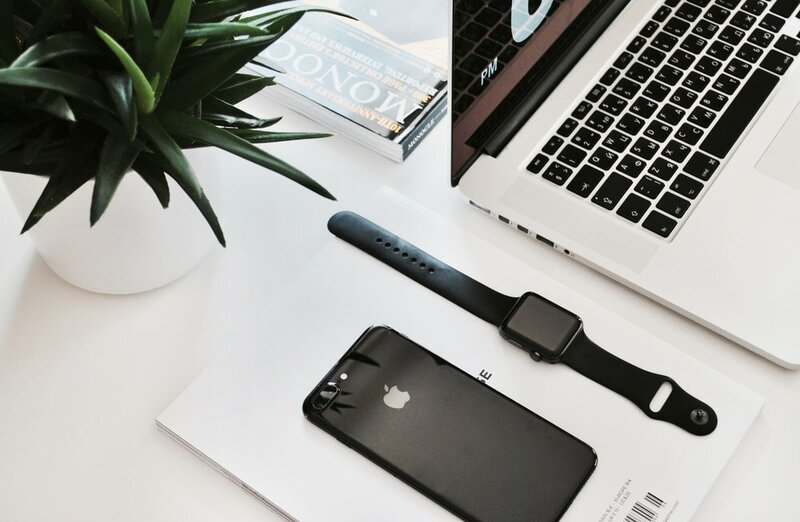 An interesting read by CMI which highlights why we are working so hard to help our clients work Smarter Not Harder through our Personal Productivity sessions.